>Last Friday, around four in the afternoon, a fire broke out at 1305 Cedarbrook Drive in Rome, NY. Smoke and fire were reportedly coming from the house when the fire department rolled onto the scene. Trapped inside where three feline friends, but their sole guardian, Dawn Baris, was not at home at this time. According to one report, the house suffered substantial heat and smoke damage through out. According to Rome Deputy Fire Chief Mark Kohlbrenner, two of the three cats did not survive. EMTs administered oxygen to the third cat, the cat is going to live. 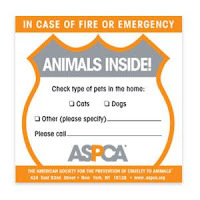 While we can’t all stay home to watch our companion animals 24/7, we can help fire and rescue teams by putting a decal on our front doors or windows that lets them know their are animals inside. You can buy one from most pet stores or you can order a free one from the ASPCA. This entry was posted in aspca, feline (cat), pet safety on September 1, 2009 by saro.